It may yet prove to be underpriced, but just 1 ounce of gold is still rather expensive. Such costs could keep you from allocating capital to this very necessary hedging investment. Think of it this way: At current gold spot prices, 1 ounce of gold costs about $1,185. With that money, you could buy 4.5 pounds of silver. It could also buy more than 400 pounds of copper. Now, we're not suggesting you buy copper or silver in lieu of gold. But we see why gold prices can deter you from putting gold in your portfolio. Luckily, exchange-traded funds allow you to buy in increments smaller than 1 ounce of gold. This lets you get in on gold investing without having to pay a value density premium. One gold ETF that allows for this is the SPDR Gold Trust (NYSE Arca: GLD). 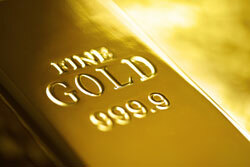 The fund will issue shares against the value of its gold holdings. The SPDR Gold Trust rebalances its portfolio and shares to track gold price movements as accurately as possible. Each share is worth one-tenth the value of one ounce of the yellow metal. This allows you to take advantage of gold price movements without having to pay the full price for 1 ounce of gold as would be the case if you stored it yourself. But some gold funds offer the opportunity to buy gold at a price even lower than this. Right now, gold investors can effectively buy gold at a discount. Open-end gold mutual funds will sell shares against the value of their gold holdings much like gold ETFs. Those funds will continue to issue shares as long as the demand is there. That means the share price will reflect the net asset value (total value of holdings divided by number of shares). Gold ETFs will sometimes provide opportunities to buy at a discount. But typically, ETFs don't provide the opportunity to get a very deep discount because ETFs trade with market makers that facilitate a tight bid/ask spread around an ETF's NAV. You might rethink your statement about 3 tons of copper. $ 17,500 is the going rate for 6,000 lbs of copper @ $2.92 a lb. Don't make yourself look so stupid. Good call, I actually originally had it as “a pound of gold could buy you three tons of copper” (in an attempt to equate the quoted price of copper at a pound with gold at a pound) and never went back and changed it when I edited it. Though as written it was a horrendous mistake that has since been fixed.